So I have been seeing examples of fur mantles and other fur accoutrements on popular shows such as game of thrones. I was wondering if there was any historical significance or widespread use of such items. I enjoy the style and look of these items but I try to keep my kits as historically accurate as possible. Any info and answers would be appreciated. I know nothing about fur mantles. Vikings used fur trim around the edges of their cloaks, and sometimes their cloaks were lined with fur. The Icelandic Vikings had a cloaks called vararfeldur, which looks like a fur cloak but actually it is not (so don't be fooled). The vararfeldur was a woven garment made with their homespun wool using a rya knot. A verarfeldur looks like a flokati rug. Sometimes they were called Icelandic trade cloaks. Additionally, the pelts could be trimmed or untrimmed. Pelts can be trimmed so that only the white belly fur remains, whereas the untrimmed pelts include much of the grey or red fur of the body. Obviously, a cloak made from trimmed pelts was more expensive than one made from untrimmed pelts. 2. The thick winter coat of the Eurasian red squirrel is gray with white belly fur, and is shown in illuminations as white and blue pelts (for the wealthy). 3. The thinner autumn coat of the Eurasian red squirrel is reddish with white belly fur, and is shown in illuminations as white and rust pelts (for the less wealthy). Here is a miniver-lined cloak from the Mac Bible, looks to me like it's untrimmed miniver. Substitute a rust color for the blue, and you have a bische cloak. I've seen some members of the House Stark with a dead muskrat draped over their shoulders and John snow (the black sheep of the family) wears a cloak with a black sheepskin. Is it those items you meant? Sheepskin is one of the (if not the) cheapest kind of fur available in the medieval period and while I have seen it mentioned in a sumptuary law as being okay to wear for commoners I have not seen a garment made out of it. Some Anglo-Saxon reenactors also drape dead rodents over their shoulder, but I can't tell to what extent they actually researched that. For all I know they just liked the look of it. EDIT: Late medieval clothing for the rich sometimes features brown/black fur trimming/lining. Sable, mink, marten and all those types of fur. Those aren't "dead rodents", they're wolf skins. I'd like to see their research on carrying animal skin across their shoulders, as I've not found any data supporting that. Maybe I need to go back and read the Sagas again. The members of that group take things so seriously, in terms of research, that I doubt they'd just sling a pelt over their shoulders on a whim. I'm with Parick on this. 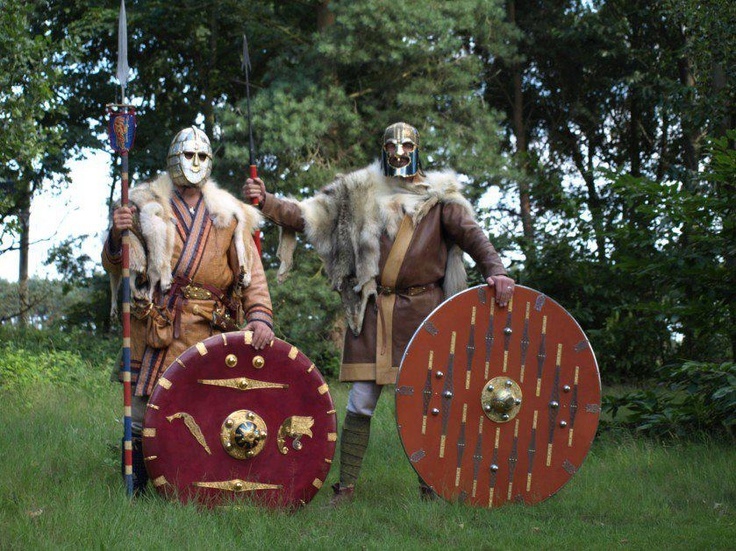 They are a living history group and take accuracy very seriously. Based on info from their website, they acknowledge that a "perfect recreation" is of course very difficult for obvious reasons, but that their "assemblages" are based off of grave finds, iconographic material, and other archaeological resources. Their use of it lends more credibility to the idea in my mind. I would dare say that cloaks lined with rabbit pelts would have been used by the "lower/middle" classes ? I can't see that a resource like rabbit skins would have been neglected ? And as for the "dead rodents" in the pictures above, didn't the Vikings have a class of "wolf" warriors, akin to the Bersekers ? I can imagine them wearing Wolf skins ? I spent a lot of time researching Viking cloaks - read through many books on Viking clothing, and dozens of online resources. I did not find any mention of animal skins worn like cloaks or mantles. Regardless of their reputation as a living history group, I would really like to see their references for wolf skins worn in this manner.